Spacel Comfort Medium is Type 3,4,5 and 6 and silicone & latex free. - 3-piece hood - special crotch design - dual slider zipper. - knee pads. Enhanced protection: - Stitched & taped seams for better tightness - double adhesive flap with double zipper. EN 14126,‎ EN 1149-5, EN 1073-2, EN 13034:2005+A1:2009 Type 6, EN ISO 13982-1:2004 Type 5,‎ EN 14605:2005+A1:2009 Type 3,‎ EN 14605:2005+A1:2009 Type 4. 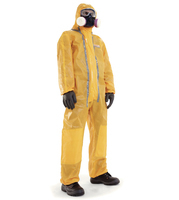 The 3M™ Protective Coverall 4570 is a chemical protective suit with Type 3/4/5/6 levels of protection. 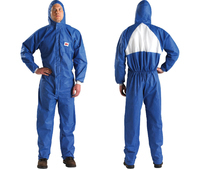 Double front closing system with internal stormflaps for extra protection, Large zip pulls for ease of use, Elasticated cuffs with thumb loops for secure fit during overhead work, Elasticated waist and ankles for increased comfort and freedom of movement, Adhesive chin flap, Super low-linting, Anti-static. EN 14126,‎ EN 1149-5, EN 1073-2, EN 13034:2005+A1:2009 Type 6, EN ISO 13982-1:2004 Type 5,‎ EN 14605:2005+A1:2009 Type 3,‎ EN 14605:2005+A1:2009 Type 4. Soft breathable fabric also resistant to noxious dust and splash. Non-linting. Ideal for use in a wide range of applications. Laminate material increases water resistance. Type 5/6. EN1149-5 EN1073-2 EN14126. Tear resistant non-woven material which is tough, breathable and offers a superb particle/fibre barrier. Protects against liquid splashes. Complete with elasticated hood, waist, cuffs and ankles. 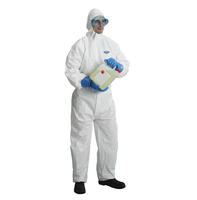 Suitable for paint spraying, chemical handling and general maintenance. 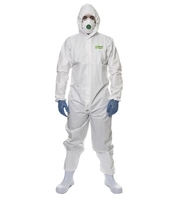 Breathable fabric giving protection against chemicals, oil. Flame retardant. Type 5/6. 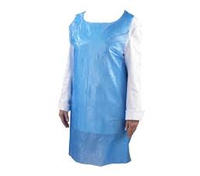 Disposable overall in 40g polypropylene, elasticated wrists, ankles, hood and waist, zip front fastening, individually bagged. Boxed 50 per size. 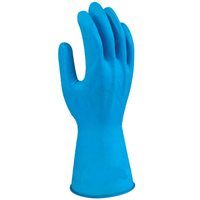 Europe's first Ambidextrous Fish Scale Grip Nitrile Household Glove** Ambidextrous extra long and thick nitrile household glove with fish scale type grip on palm and back. Powder free. 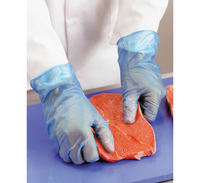 Food Handling (EN 1186) Approved for all categories including fatty foods. EN ISO 374-1:2016+A1:2018; EN 420:2003+A1:2009; EN ISO 374-5:2016 Box = 25 pairs, Carton = 250 pairs. Ambidextrous extra long and thick glove household glove. Powder free. Food Handling Approved (EN 1186)for all categories including the key fatty foods category. EN 420:2003+A1:2009; EN ISO 374-1:2016; EN ISO 374-5:2016 Pack = 25 pairs, Carton = 250 pairs. Order in multiples of 10 packs. Violet blue colour. Textured fingertips enhancing grip. Used in over 6000 hospitals worldwide. 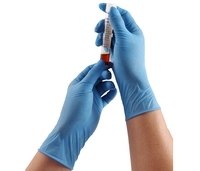 Utilizes unique Single Dispensing System (SDS) allows gloves to come out one at a time rather than in bundles. Box = 100 gloves, Carton = 1000 gloves. 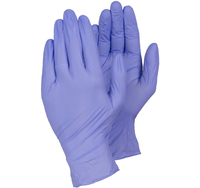 Accelerator free purple ambidextrous disposable glove. Powder free. Food Handling Approved. Box = 100 gloves, Carton = 1000 gloves. CLICK Medium Weight Household Glove. Manufactured from natural rubber latex. Cotton flock lined. Flexible and comfortable to wear. Offers a high degree of sensitivity. Large Size. Suitable for food handling. CE Minimal Risk. 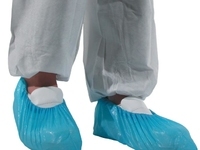 Anti slip breathable overshoe in white 45g polythene with a white high slip resistant polyethylene embossed sole. Elasticated top. Length 40cm height 15.5cm, sole width 13cm. Pack = 100, Case = 1000 Shoes. 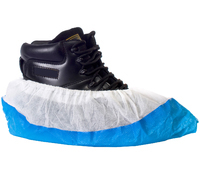 If you work in an environment where Hygiene is paramount or the use of shared footwear is essential, then our unisex disposable socks could be an ideal addition to your footwear requirements.﻿ Our socks are designed to be literally 'one size' fits all. They are tubular in style and have no defined heel and so are suitable for both male & female. 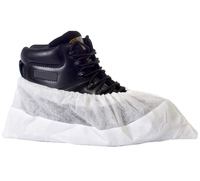 They are ideal for food production areas, laboratories, visitor centres where safety footwear is required or any general work place environment. Many of our customers purchase our socks for visitors & contractors, who visit their sites and have to wear 'borrowed footwear' such as wellingtons and boots. These hygienic disposable socks are also highly recommended by large supermarket chains for their suppliers to wear during food production. BOX 200. Disposable Peaked Mob Cap WHITE. 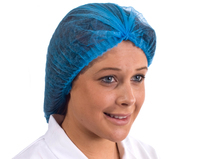 Ideal for use within colour-coded work environments - perfect for the food industry. 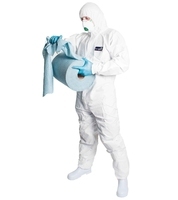 Disposable overcoat in 40g polypropylene, elasticated wrists and velcro front fastening, with collar, no pockets, individually bagged. Boxed 50 per size. 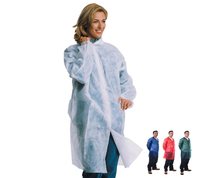 PE Disposable Visitors Coats are manufactured from embossed polythene. Extra white hue. Length 120cm. Width 70cm. 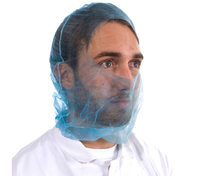 The Economy Polypropylene Balaclava Hood is ideal for food handling, perfect for a whole host of hygienic work environments. 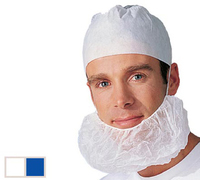 Made from Spun polypropylene, 36cm from crown to neck, Full head enclosure, Elasticated neck band. 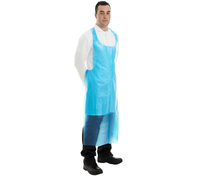 Apron manufactured with embossed polythene, length 120cm, width 70cm. 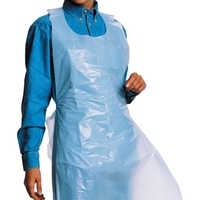 Polyethylene Apron on a roll. Length 122cm x 69cm width. 50 microns thickness. Supplied in Case of 500 i.e. 5 rolls of 100. Polypropylene non-woven 18g fabric with elastic fastenings. 20 PACKS OF 100 IN A CARTON (Order in multiples of 20 packs). 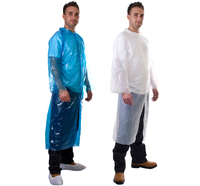 Heavier Weight 50 Micron Apron manufactured with embossed polythene, length 120cm, width 70cm. Flat Packed, Box 500. 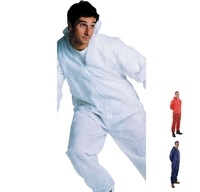 MICROCHEM 4000 Coverall 111 GREEN. 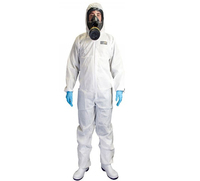 MICROCHEM® 4000 is designed to provide an exceptional barrier against organic and inorganic chemicals and biological agents. 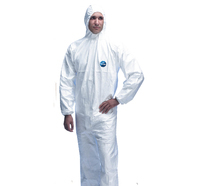 A unique multi-layer barrier fabric renowned for its lightweight, yet robust textile feel and exceptional barrier to organic & inorganic chemicals. 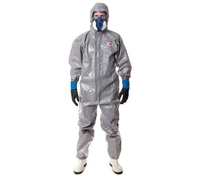 Standard Type 3 EN14605 Liquid tight suit, Type 4 EN14605 Spray tight suit, Type 5 EN ISO 13982-1 Dry particle suit, EN14126 Barrier to infective agents, EN1073-2 Barrier to radioactive particulates - Class 1, EN1149-5 Anti-static.